Well we got our new engine from JR Motorsports installed into the #66 Dodge ram and headed back to Lethbridge. The day looked very ugly with clouds and rain all the way to the Bridge County Raceway but at the track it was dry all night. I went out for track pack and the engine felt great, but three laps into the main I lost power and had to come in . We were done for the night finding out that the pistons hit the heads and ruined yet another engine. On Monday we pulled out the engine and took it to Dan Lee in High River. He is going to be able to repair both engines but for the mean time he lent me a 327 engine from his IMCA Modified car… Thanks Dan. Well what a week!!! Installing the engine in the truck and getting the car ready, we were extremely busy. I am taking the truck to Lethbridge while Cliff will take the car to Cranbrook to keep us in the points. 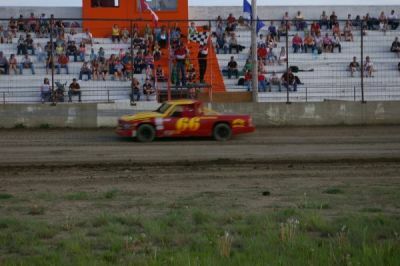 In Lethbridge I finished second behind Calvin#11 in the heat race. Then the track went dry slick and I had to learn how to drive all over. In the main , I was just starting to move up when there was a loud bang, I thought I blew up the engine when we got to the pits and found out the main power wire had broke off the fuse panel. We were able to fix it and get back to the track only being one lap down. I was able to learn a lot by racing all by myself and I was able to catch and pass the two last cars and was faster than the leaders but ran out of laps. In the same time Cliff was having troubles of his own with the car engine. The exhaust valves had hit the pistons and he was only running on 6 cylinders. He finished all the races and ended up sixth in the main. More work this week.. . . 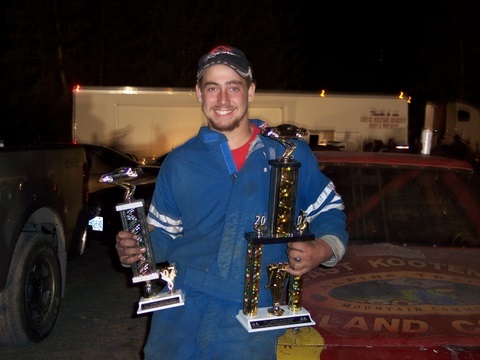 Racing in Cranbrook today was full of pressure We had the IMCA Modifieds in for the day and a Street Stock open race. Calvin was the only car that came from out of town for the stocks and we had nine Modifieds show up. Not very great numbers, but they put on a good show anyway. We had nine cars for the stock car race and I finished third while Cliff finished eighth. Cliff won his trophy dash on seven cylinders again..and ended up breaking more in the first laps of the main. I lead the trophy dash right to the end and then Calvin passed me on the last corner. Darn.!!!. In the first heat race Calvin and I both got flat tires and had to come in to the pits. I got back out but we were real loose. We ended up pushing the pushrods through the rockers and losing all power in the second heat race and I thought we were done but the crew; Don, Marty, Gene, Josh, JD ,and Ken got the engine running for the main. The engine lost some power at the end and I could not catch Calvin who was chasing down Trevor Hansen #28 who ended up winning . Way to go Trevor. 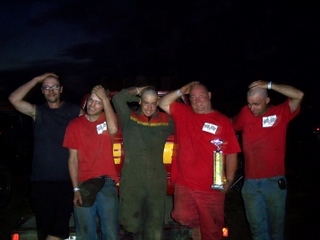 The Modifieds raced well and seven of the nine cars finished the race. The band Lillix played in the spectators section along with two other bands and then there was fireworks at dusk Over all it was a pretty good day. Cliffs 18th birthday and the race was sponsored by Mitchell Excavating. It should have been my night to win. Not so though . Before qualifing we found two exhaust valves stuck in the head. I went out with 6 cylinders and ended up racing in the slow hobby group. Not a place that the #66 Red Rabbit is used to running. First race I got into Jerry Lavalley #26 and broke a tire stem, then in turn 3 Tanice #5 gets into my front and breaks the upper A arm. I came into the pits and the boys went straight to work. Cliff comes from the pace truck and installs the ball joint and A arm. Mike Peters, a new guy that is coming to the races with us jumps right in and was a great help. Gerry and Ken take over and make sure everything gets done. We are ready in time for the next heat race I went out with no power steering and have a great race with Nikki #18 and then I ran into some more problems in the engine and I had to slow down She wins the race though, way to go Nikki.. In the pits the guys find we have all the exhaust valves stuck in the left head. I started the main with 4 cylinders planning on just getting start points but the oil pressure is good and the water temp stayed down so I stayed out and finished the race. A few racers went off the track like John Scarpelli#24 and Monte Sosnowski#02 so I did not finish last. Finally we finish a race with eight cylinders. 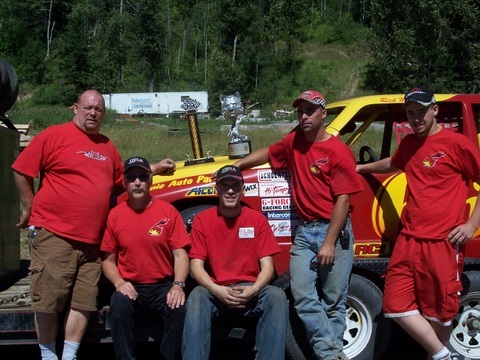 We are still using Dan Lees engine and the Fernie Chrysler Dodge Ram was running great.. We had a great crew with Rod Talbot and his wife Suzanne along with Jordann coming out to give us support. Thank you very much. After the first heat we found a bolt sticking out of the rear end cover and had to do a repair on that. I missed the second heat and ended up starting the main at the front. I race hard against Dale #54 for a whole pile of laps and then got away for a while. 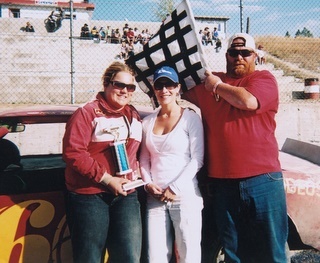 Then at a late caution, the other cars get a final shot at me but I held them off and won the main!!! Kathy, the boss of the track comes up with a pair of clippers after all the racing is done and somehow Cliff gets them and shaves my face and head right there in the pits. The crew is so dedicated that Donnie, Mike, and Josh take their turn under the clippers. Then Cliff sat down and Donnie shaved him. Looked like Jordann was going to cry when that happened… but it grows back… ha ha!! What a crew..... Now we must get ready for Calgary and the Wolff Pack Run. The Wolfe Pack Run is going to be in my memory for quite a while. We worked late every night to get Mike Elmers car ready for Cliff to take. Tuesday, Cliff and I went to get my engines but only one is ready, Cliff showed some discouragement and Dan Lee lends him the 327 again. The same engine I won with in Lethbridge. We installed the engine in my truck on Wednesday and then did the car on Thursday for Cliff. Friday we worked our butts off and got them both close to ready. Cliff woke up early and finished up a few things and we headed out. We got to the track at Race City Motorsports Park, late and missed the hot lap session. Cliff corners great, but is having problems. He finished 5th on Saturday and on Sunday after getting wrecked by the #46 car, ended up 8th. He had lots of problems but did some real good driving. I qualified fastest both days and followed it up with good runs in all my races. I finish 2nd in the first heat after chasing down #88 Munroe Savage, but couldn't get by him. In the main I led for most of the race and on a bad restart , Calvin #11 passed me and as hard as I tried I could not get by him. After some problems at tech Calvin was disqualified and every one moves up a space. He had boiled over a bunch of water and it made him light on the scales.. The Sunday show was the one for the big trophies and cash. We started out fastest and after a hard fast battle with Calvin where we were trading spots on the final laps ended up with me beating Calvin by about 6 inches. The crowd went nuts. In the Main after seeing Cliff make a great save on the back stretch I head to the front. On the 14th lap I was leading at the closing laps there was a caution but I was not getting caught this time. I took off and then found there was a lap car between Myself and the second car, #7 Rob Ford. At the end of the race we both did burnouts and smoke up the front good. My sponsor Pat Cherak was there and I did the burnout in front of him. It was great. I got a beautiful Wolf shaped trophy. Thanks to all the put on such a great show . 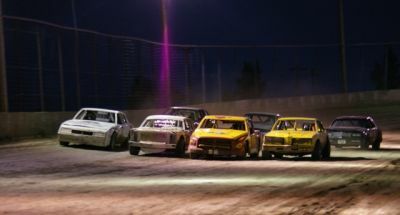 Our first Wednesday night race at Cranbrook International Speedway started out great. The Stratton Plumbing, Shoesmith Enterprises, Chevy Monte Carlo ran on eight cylinders all night. I started the Trophy Dash and the first heat race on the pole and led the whole way having my son Cliff giving out the trophy was very special as Giv’er Shirtworks, who do my shirts etc, were the sponsors of the race night. Thanks Scottie for the great logo. The second heat race consisted of all the cars at once and I started at the very back. I raced hard with #5 Tanice Habart and finally got by her on the inside. I got by clean, but Trevor #28 spun her out and ended up getting sent to the back. To bad as we would have put on a great race. I got the lead and kept it for the checkers. My crew helped out a bunch of racers , Rod Talbot#52 broke an A- arm, Rob Powell broke a caliper and Monte #02 had a radiator problem or something. They are by far the best crew around.. The main started with me in the middle of the pack, again racing with Tanice #5 and Roy #33, her husband , for the first half of the race then I got by and had to race with Jack Chisom #13 and Wendell Maki in the #16. Jack had problems and it was #16 and I out front. In turn three I tried to go under him but he slams the door on me and I end up driving over his front tire, then in turn one he spins out from a flat tire and I hit him again. He goes off the track and I got sent to the back When he came out of the pit he took his spot back so the flagman Dave let me come up and get second back. We race for some more laps and then going down the back stretch my ball joint broke and I skidded into the wall on turn 3, no steering, no brakes and it took forever. 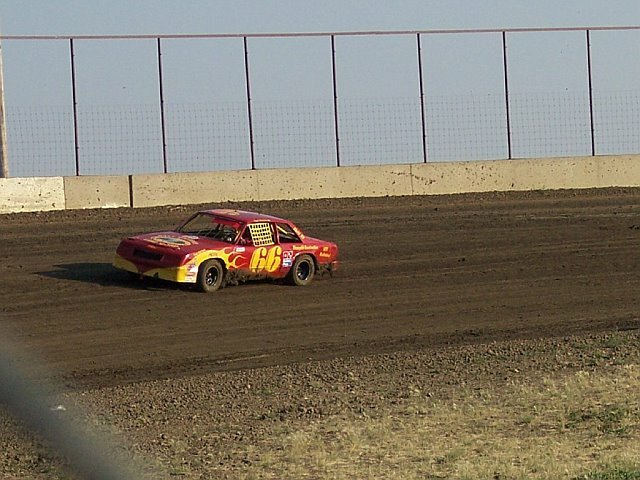 The only thing that helped was in the dirt I hit the gas and turned the car sideways a bit. BOOM!!!! hit the wall bounced and was still moving, No front wheel but I drove off the track hoping to get fixed and back in but it was hurt good. We did get a spindle on and was able to drive on the trailer. All and all it was a good night. You can’t win them all. Off to Lethbridge on Saturday so hope to see you all there. Bye for now. Oh what a party!!!! The day was a great day from the start, we all start bugging Marty Garrett ,one of my team members, about his stag party that is on Saturday night. He does not have any idea where we they are taking him> But after many tequila and beer they show up at the track with Marty in a dress and boa. They got to enjoy a great race night with the stocks, the modifieds, and the sprint cars all racing on a wet slippery track. The mods started 19 cars and finished with 6. The stocks had some crashes as well. I had Calvin pushing on my bumper for a while and hit the wall during mud pack but that was the only damage to the EMCO Waterworks Dodge Ram. In the first race I caught up to Calvin but could not pass him, but I got ahead of him in the next heat and held him off for the checkers. The main started out real slippery and car #69 JR Zillman as well as Calvin #11 got a half lap lead on me but I was closing in when there was a caution, I was able to get behind them and then on the restart I got past the #69 but could only get up to Calvins bumper and then slipping on the last lap I finished second. Then we went parting with the "Marty Party". Bus ride home at 5:30 am It was great. Our last Wednesday night race of the season. It started out good as I won the trophy dash but in the heat race I ran hard but fell back and finished in the rear on both heats. The parts had not come in and we were running stock A-arms that we didn't get setup right. In the main we got the brakes fixed but wore out a brand new tire on the right front. I finished fifth in that race but I had to drive hard to get there. Bridge County Raceway had some great racing tonight. The claimers and the trucks put on a good show and then the stocks and sprints finished off the night. In the first heat race Dale #54 rolled his car on turn one and car #53 spun out and backed into the wall at the same time. 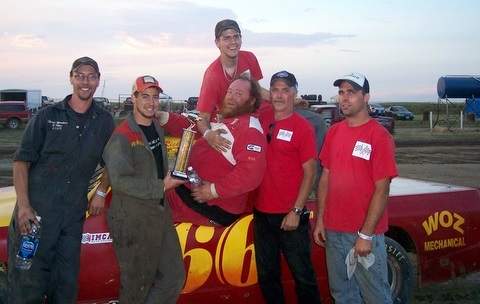 The race was red flagged for a while and when Dale got into the pits, the Red Rabbit Crew went over and helped him get back into the race night. He ended up beating me in the main. The second heat race I raced hard with Calvin and beat him to the checkers. It was real good to win the heat. In the main I started near the back and moved up to third when I got into #77 car knocking his door off and breaking an A-arm on my car. I wasn’t sure what happened so I stayed out for about 5 laps and fought the car to stay on the track. Then after bumping into #54 I got a flat on the right front tearing up the fiberglass and parked me for the night. Oh well sometimes it is not your night but this night was freaky #11 car won the claimers, #11 car won the trucks, #11 car won the stocks and #1 won the sprints then when I stopped in Brocket for fuel it came up $111. I guess it was Calvins’ night. 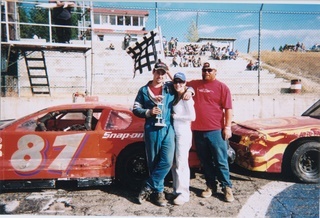 Sept 9 2007 Well we did not get to race in Lethbridge on saturday night because of the rain storm that went thru during the week We did get to race in Cranbrook on sunday where wew did 100 laps of racing. The heat races where 20 laps with a 60 lap main event it was my longest race of my career. I qualified second fastest to Courtney #23 who is leading the points. In the trophy dash I started in the back and ended up winning. It was a beautiful trophy sponsored by Lordco which I gave to my Father in law,Larry who came up from Oregon to watch us. The heat races where a work out with me chasing Monte#02 and Trevor #28 in the first one then in the second race it was Trevor#28 and myself racing hard for the win but I got in to deep and we both spun out in turn one. Noone got by us and we both savedit and returned to the track. I ended up with a black flag warning and second place. The main started with Mike Elmer#87 and I right at the back and we raced hard for the beginning and then when I noticed Mike smoking a bit I decided to stay ahead of him. I got right to third place before halfway and raced hard with Monte and Trevor until with 20 laps to go I got by Monte and he ended up breaking his throttle linkage triing to keep up Then it was just Trevor and I About ten laps to go Jordan#13 spun in turn three I saw her come out of the dust so I drove right thru while Trevor backed off. I lead until Mike #87 spunout on Jordans car then on the restart Trevor jumped me on the inside and after a few laps he had the lead again I could not get by and he won. Great Race from all the hobby stock drivers. Sept16 Cranbrook wrap up was real good as well. I didn't feel well so Cliff drove the Mitchell Excavating Monte Carlo He qualified second fast to Courtney #23 and won the trophy dash. Mike Elmer had a good car and was fourth fast but in the heat race he slipped up and hit the wall. He broke an axel and control arm on the back and ower A-arm and balljoint etc... in the front. He was done for the day. I helped Reg Pocha in the flag tower for the whole day It was different up there. In the heat races I had to give Cliff a black flag warning as he bumped into Trevor Hansen#28 and spun him out. In the main Cliff makes an awesome move in the second lap and comes from the back and gets to the front in one lap. Way to go buddy! Just before half way Trevor gets up beside Cliff and bumps him. Cliff ends up with a flat tire and spins out. He made it into the pits and got fixed up. He came out and finished in fifth place... enough to keep me in fourth place in points. Thanks Cliff!! Lacey decided that racing wasn't all that bad when she put the #66 in the winners circle for the Powder Puff... Cliff drove the #87 Sportsman in the pitmans race to see if he wants to possibly buy it.... Won the race... hmmmm.... Will Cliff and Randy be talking $$ or not?? It was a good party after with Darcy and Jack bringing bbqs and cooking up corn,hamburgers,hotdogs and even pork ribs. It was really good after a long season. Sept 22 and 23 Oh what a hectic week. We got an engine for Cliffs car but had to put it together. Got it ready Thursday and bought a car for it to go in,Mike Elmer was going to lend Cliff his car but wrecked it on the last sunday, Took the engine up to Dan Lees shop on friday night after loading my truck for Jeri to bring up on saturday.Thanks honey. Got there at 8pm and by 3am we had the car running and the nose fixed and other dents out. It looked better than ever. I qualified second fast at a 19.99 but got disqualified when I didn't go to tech. I started up front in the heat race and walked away from them all. Just about spun out in turn one but saved it and won the heat,Rod Talbot,who bought Courtenys car, finished fourth after a good race. Cliff had troubles changed distributor three times and carberator twice. Then Kieth the tech guy at Imca, reset the valves and away Cliff went. He lead his heat race for the start and got a push in the corners and ended up finishing fourth. Then the rain came and racing was cancelled for the rest of the weekend. We go up and race this sunday and then that is it for the year. Except maybe Rosetown on thanksgiving.